Now available! IAC's sturdy laminated versions of the 2017 U.S. child/teen immunization schedule and the 2017 U.S. adult immunization schedule�order a supply for your healthcare setting today! IAC updates "Screening Checklist for Contraindications to Vaccines for Children and Teens"
IAC updates its staff education materials: "Current Dates of Vaccine Information Statements" and "It's Federal Law! You must give your patients current Vaccine Information Statements"
IAC offers 48 new VIS translations! The April issues of Needle Tips and Vaccinate Adults are now available online. Vaccinate Adults is an abbreviated version of Needle Tips with the pediatric content removed. These issues highlight IAC�s updated summaries of immunization recommendations, as well as the 2017 U.S. immunization schedules. The April issues also feature the always popular �Ask the Experts� column, with Q&As by experts from CDC�s National Center for Immunization and Respiratory Diseases. Click on the images below to download the April issues (PDF) of Needle Tips and/or Vaccinate Adults. Needle Tips: View the Table of Contents, Ask the Experts section, magazine viewer, and back issues. Vaccinate Adults: View the Table of Contents, Ask the Experts section, magazine viewer, and back issues. On April 11, CDC posted an updated Td VIS. This update corrects an error in the 2/24/2015 Td VIS. The instruction to talk to your doctor if you "have seizures or another nervous system problem" has been removed. This precaution applies to Tdap vaccine but not to Td, and was inadvertently included on the Td VIS. Providers may use up existing stocks of the outgoing VIS, but should make patients aware that this is NOT a precaution for Td. National Infant Immunization Week (NIIW) is an annual observance to highlight the importance of protecting infants from vaccine-preventable diseases and celebrate the achievements of immunization programs and their partners in promoting healthy communities. NIIW will be held this year on April 22�29. Access all these resources on the NIIW Promotional Materials web page. Visit CDC's updated NIIW website to find promotional and educational materials to help you plan your NIIW activities, and tailor them to the needs of your community. CDC would like to hear from organizations planning a 2017 NIIW activity. Please complete the NIIW Activity Form so others can learn what you're doing to educate and inspire parents and providers to protect infants and toddlers from vaccine-preventable diseases. If you're looking for ideas, you can access events scheduled for 2017, and NIIW events held in past years from CDC's NIIW Activities around the World web page. From January 1 to March 25, 2017, 42 U.S. states and the District of Columbia reported 1,965 mumps cases to CDC. Some information from CDC's website follows. In some years, there are more cases of mumps than usual because of outbreaks. Mumps outbreaks can occur any time of year. A major factor contributing to outbreaks is being in a crowded environment, such as attending the same class, playing on the same sports team, or living in a dormitory with a person who has mumps. Also, certain behaviors that result in exchanging saliva, such as kissing or sharing utensils, cups, lipstick or cigarettes, might increase spread of the virus. MMR vaccine prevents most, but not all, cases of mumps and complications caused by the disease. Two doses of the vaccine are 88% (range: 66 to 95%) effective at protecting against mumps; one dose is 78% (range: 49% to 92%) effective. The MMR vaccine protects against currently circulating mumps strains. Outbreaks can still occur in highly vaccinated U.S. communities, particularly in close-contact settings. In recent years, outbreaks have occurred in schools, colleges, and camps. However, high vaccination coverage helps limit the size, duration, and spread of mumps outbreaks. The 6th edition of The Vaccine Handbook: A Practical Guide for Clinicians ("The Purple Book") is considered a vital source of practical, up-to-date information for vaccine providers and educators. 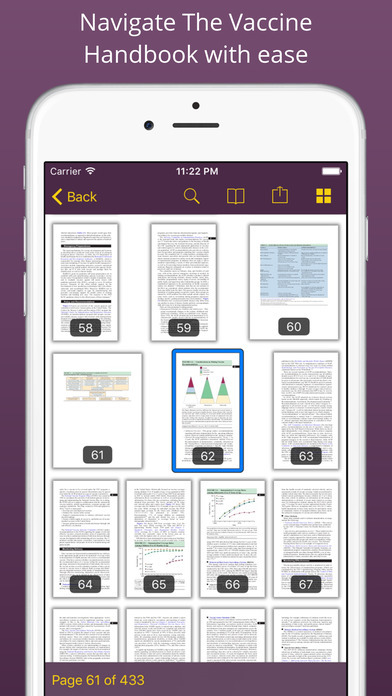 Now printed in color and updated with the latest vaccine information through early 2017, "The Purple Book" draws together the latest vaccine science and guidance into a concise, user-friendly, practical resource for the private office, public health clinic, academic medical center, and hospital. 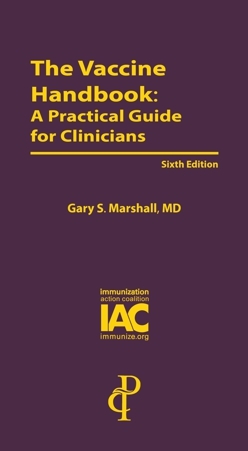 The sixth edition of this valuable guide (592 pages) is available on IAC's website at www.immunize.org/vaccine-handbook. The price of the handbook is $34.95 per copy, plus shipping charges. Order copies for your staff or for distribution at an upcoming conference. Discount pricing is available for more than 10 copies. For quotes on larger quantities, email admininfo@immunize.org. Order your copy today! Click on the image below to visit the "Shop IAC: The Vaccine Handbook" web page. The Vaccine Handbook App for Apple iPhones and iPads is available free from IAC. Sorry, the app is not available for android devices. Book purchase is not necessary but registration to obtain the app is required. The app is fully searchable, allows for bookmarking, highlighting and annotation, and contains hyperlinks to valuable content from nonprofit and governmental sources. Click on the image below to visit the The Vaccine Handbook App page in the iTunes store. Gary S. Marshall, MD, is professor of pediatrics at the University of Louisville School of Medicine in Kentucky, where he serves as chief of the Division of Pediatric Infectious Diseases and director of the Pediatric Clinical Trials Unit. In addition to being a busy clinician, he is nationally known for his work in the areas of vaccine research, advocacy, and education. IAC's What's New at IAC web section is a fast way to check out what has been recently added to the immunize.org website. This page lists IAC's new and recently updated free print materials, Vaccine Information Statements (VISs) and translations, and changes to IAC web sections such as "Ask the Experts." Just click on the "What's New at IAC" link in the box at the top of the home page, or bookmark www.immunize.org/new for an easy way to check what's new. Laminated schedules are printed in color for easy reading, come complete with essential tables and footnotes, and include contraindications and precautions�a feature that will help you make an on-the-spot determination about the safety of vaccinating patients of any age. IAC recently revised Screening Checklist for Contraindications to Vaccines for Children and Teens. Changes were made to item #8 on page 1 and page 2 to include immune system problems in family members of the potential vaccine recipient. IAC recently revised Current Dates of Vaccine Information Statements as well as It's Federal Law! You must give your patients current Vaccine Information Statements to reflect the 4/11/2017 date of the updated Td VIS. IAC has recently added the following VIS translations to its website. The Mississippi Immunization Task Force has produced a new public health campaign, Give Me a Shot. Their website at www.givemeashot.org includes useful information for those looking to advocate for vaccination at the legislative level. WHO published Immunization and Vaccine-Related Implementation Research Advisory Committee (IVIR-AC): summary of conclusions and recommendations, 1�2 February 2017 meeting in the April 14 issue of its Weekly Epidemiological Record. The theme of the meeting was research to minimize barriers and improve coverage of vaccines currently in use. Every Child By Two (ECBT) has collaborated with Young Minds Inspired (YMI) to develop the Vaccinate Your Family program for daycare providers. The goal of the program is to help daycare providers inform and educate the parents and grandparents of children in their care about the key role they play in protecting children against serious vaccine-preventable diseases by keeping their own vaccinations up to date. 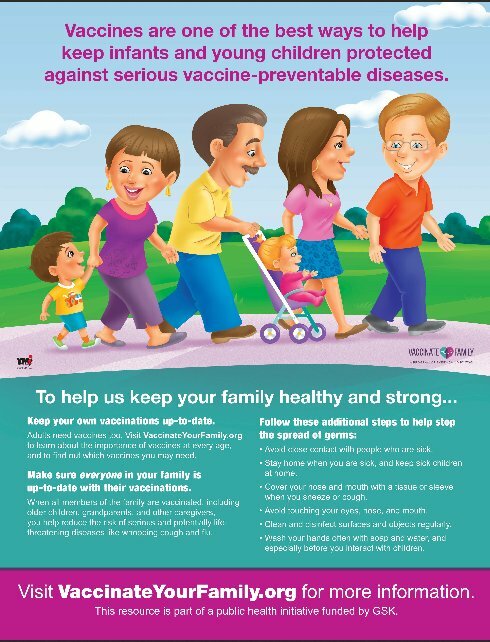 Daycare providers and other vaccine advocates can use these fun activities, take- home handouts, and wall poster to raise awareness of the importance of vaccines for people of all ages, not just children. The program materials can be downloaded from ECBT�s Vaccinate Your Family website or the YMI Classroom website. ECBT also has a limited number of hard copies of the posters available. If you are interested in receiving one, please contact ECBT at info@ecbt.org. CDC published Notes from the Field: Complications of Mumps During a University Outbreak Among Students Who Had Received 2 Doses of Measles-Mumps-Rubella Vaccine�Iowa, July 2015�May 2016 in the April 14 issue of MMWR (pages 390�1). The first paragraph is reprinted below. During July 2015�May 2016, a mumps outbreak occurred at the University of Iowa, which is located in Johnson County. A total of 301 cases of mumps were diagnosed among students. To characterize the outbreak, the Johnson County Public Health Department, the Iowa Department of Public Health, and the University of Iowa, with assistance from CDC, conducted an investigation through telephone interviews, medical chart abstractions, and review of immunization records. Among 287 (95%) students with mumps for whom clinical information was available, 20 (7%) patients with complications were identified (16 self-reported and four clinician- diagnosed). The 20 cases included 15 (5%) cases of orchitis, three (1%) of transient hearing loss, two of mastitis, and one of meningitis (one patient had both orchitis and transient hearing loss). All 20 patients had documentation of receipt of at least 2 doses of measles-mumps-rubella vaccine. Because data are limited regarding the presentation and clinical course of mumps complications in persons who have received 2 doses of mumps-containing vaccine, three illustrative cases of complications (orchitis, transient hearing loss, and meningitis) in students with mumps are presented. CDC will sponsor a 1-hour NetConference on May 2 at 1:00 p.m. (ET) titled "'Best Practice' Tools for Holding Safe Vaccination Clinics in Temporary Settings: Checklist and Pledge 101." Satellite, temporary, and off-site vaccination clinics play an important role in improving vaccination coverage rates and vaccinating hard-to-reach populations. However, vaccination clinics held in these settings also have unique challenges that may lead to vaccine temperature excursions or vaccine administration errors. In an effort to standardize the process of holding clinics in these non-traditional settings, the National Adult and Influenza Immunization Summit Influenza Working Group developed a checklist of best practices and created a pledge for organizations that adhere to the checklist. The webinar will also feature a case study from an industry expert whose organization made efforts to implement the checklist during last year�s influenza season. CDC is sponsoring a six-part NetConference series on vaccinating adults that will address key issues related to protecting adults from vaccine-preventable diseases. A collaborative effort between CDC and Maryland�s adult immunization coalition and state immunization program, the "Vaccinating Adults" series will feature six presentations by experts in promoting, administering, and securing reimbursement for adult immunizations. Each session will start at 12:00 p.m. (ET). Continuing education will be available for each event. The series will be archived later on CDC's website. Advanced registration is required to participate. CDC will sponsor a webinar on April 25 from 12:00 p.m.�1:30 p.m. (ET) titled "The Path to a World Free of Polio, Measles, and Rubella, and Remaining Risks for the United States." This session will feature global and domestic immunization experts discussing the current status of polio, measles, and rubella immunization worldwide. The speakers will cover strategies that healthcare providers and public health professionals can use to help eradicate these diseases worldwide and stay alert to the continuing risk in the United States. Free continuing education is provided. ACIP will hold its next meeting on June 21�22 in Atlanta. To attend the meeting, ACIP attendees (participants and visitors) must register online. The registration deadline for non-U.S. citizens is May 22; for U.S. citizens, it's June 7. Registration is not required to watch the meeting via webcast or listen to the proceedings via phone. See the first link below for the toll-free phone number and passcode. ACIP recently posted the presentation slides and video footage from the ACIP meeting held on February 22�23. Tenivac Td (Sanofi Pasteur) for adults is expected to be unavailable until the second half of 2017. Another Td vaccine produced by MassBiologics is available at our wholesaler, but it looks like the components are slightly different from Tenivac. Are the two products interchangeable during the shortage? Yes, the Td products are equivalent and interchangeable. Each week, IAC Express highlights a new, topical, or important-to-reiterate Q&A. This feature is a cooperative venture between IAC and CDC. William L. Atkinson, MD, MPH, IAC's associate director for immunization education, chooses a new Q&A to feature every week from a set of Q&As prepared by experts at CDC�s National Center for Immunization and Respiratory Diseases. IAC Express is supported in part by Grant No. 6NH23IP922550 from the National Center for Immunization and Respiratory Diseases, CDC. Its contents are solely the responsibility of IAC and do not necessarily represent the official views of CDC. IAC Express is also supported by educational grants from the following companies: AstraZeneca, Inc.; bioCSL Inc.; Merck Sharp & Dohme Corp.; Pfizer, Inc.; and Sanofi Pasteur. Latch Lock: Parents latch cabinets, lock doors, and protect their children from other dangers like vaccine-preventable diseases. This PSA helped launch Michigan�s comprehensive health education campaign, "I Vaccinate," a public-private effort of the Franny Strong Foundation and the Michigan Department of Health and Human Service.